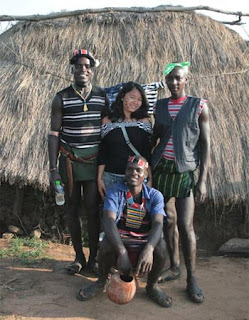 With only $700 in her pocket, Khanh Huyen traveled to 25 countries in Asia and Africa. In two years of travelling, the Hanoi girls learned how to cook many dishes, row, hike, act in films and write. After graduating from the high school for gifted students of the National University of Hanoi, Nguyen Thi Khanh Huyen decided to work immediately without studying at college. When Huyen was tired of work her job in Malaysia, she flashed the idea to travel to some countries. 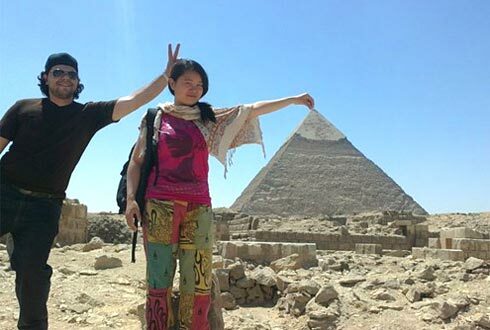 However, the trip lasted for two years, taking her to 25 countries. "When I was young, I used to say to my mum that I wanted to travel around the world. At that time she only smiled and though that I told a joke. I also thought that was my outburst and I could not do it. But it is amazing that I had such a long journey," Huyen said. In May 2010, Huyen left Malaysia to some countries in Asia and Africa. She stayed in India for four months, then three months in Nepal 3, another three months in Israel. In two years travelling over different lands, Huyen always looked for ways to save money for the trip. As a member of the Couch Surfing network in the world (sharing accommodations), Huyen was provided with free accommodations in the countries she visited by other members of the Couch Surfing network. They also helped her integrate into local communities to learn about their lives and culture. Huyen was also willing to sleep at bus stops, on the street, and on the beach as long as they gave her the sense of security. She even slept in police stations several times. "Once I slept on the beach of the Red Sea (Israel). The weather was very hot during the day but it was very cold at night. I had to wear all of my clothes in my backpack but I was still cold. In Nepal, I had to sleep at police stations several times. I had to be very patient to explain for local people that I was traveling. Perhaps I looked naïve so they had compassion for me," Huyen said with a smile. She regularly walked, for up to 40-50km a day, or hitched a ride because according to Huyen "hitchhiking is very simple. I stood on the road to catch people for a ride." Once she hitchhiked a truck in Ethiopia and overslept in the car. The car took her 200km over her scheduled destination. The driver dropped Huyen in a strange city that she had never heard of its name. But Huyen found out that this was a very interesting place after a few days discovering the city. Huyen said that these jobs did not require in-depth knowledge, just a vivacious, dynamic, bold person. These simple works were paid for the hour, immediately, so she still had time to explore destinations. "Each passing day I had different memories and different experiences. In two years, I learned many things which are as important as the knowledge that I learnt for 12 years at the school," Huyen said. She said she learned many things such as designing websites, making a film in India, Buddhism in Tibet, rowing, hiking cooking dishes from different countries, making jewelry from recycled materials and others. Travelling alone but Huyen never fell sad because she could quickly make friends with local people. "When I was sad, I went to the market to find local people to get acquainted with them. I never stayed in hotels. I always tried to stay with local people," Huyen said. On a bus in the evening in India, a young man invited Huyen to stay with his family for one night. But Huyen stayed there for a week and learned how to cook Indian cuisines learned about the culture, customs of Indian people. The family presented her gifts when she left. In her journey, Huyen met accidents and risks. She had a motorcycle accident, causing leg fracture and she had to stay in Nepal for a month to care for the injury. She experienced persistent illness in the winter in the Himalayas. She was snatched, pick-pocketed and was nearly kidnapped. At the border of Kenya and Somalia in the evening, a group of young people pressed a knife to her neck and robbed her backpack. Although she chased after them and shouted for help, people around did not help her. At that time, she fell helpless, resentment, and very alone. "The trip really helped me mature. Situations taught me how to live independently, comfortably, strengthened my adaptability and endurance. I have become bolder and stronger after the journey," Huyen said. Talking about her experience in preparing for the journey, Huyen said that the most important thing is preparing a good health and anticipate any circumstance that can happen on the road. When she returned home with sunburned skin, ragged hair, her mother was poignant, but she assured about her daughter's self-reliance. "Vietnam youngsters were wrapped carefully by their families so they are disadvantaged compared to their friends in other countries in the world. In many countries, young people are always facilitated by their families to travel," Huyen said. Huyen plans to visit South America for a year. She is also building a tourism portal, wishing to turn it into a Lonely Planet site for the Vietnamese. She is also about to release a book that she wrote about her experience in the journey.